2 What is a metal swing set? Wouldn’t it be great to have your kids engage in something else other than their gaming consoles? Perhaps, getting out and seeing the sun? Well, one way to get them out of their rooms and introducing them to one of the best metal swing sets 2018 that last them for years and through many good memories. Today, in our article, we will be walking you through some of the best metal swing sets for kids. You will have first-hand access to the top brands selling the top swings sets. And to narrow down your choices, we will hand over 5 of the best metal swing set reviews for you to choose from. Let’s begin! What is a metal swing set? A metal swing set is uses a metal framework which is used to suspend swings from it. However, unlike the traditional and old-world metal swings back in the day, modern metal swings have a lot more to offer than just swings. Some include the entire package; slide, gliders, nets, climbing walls, etc. While a few still remain simple and basic. 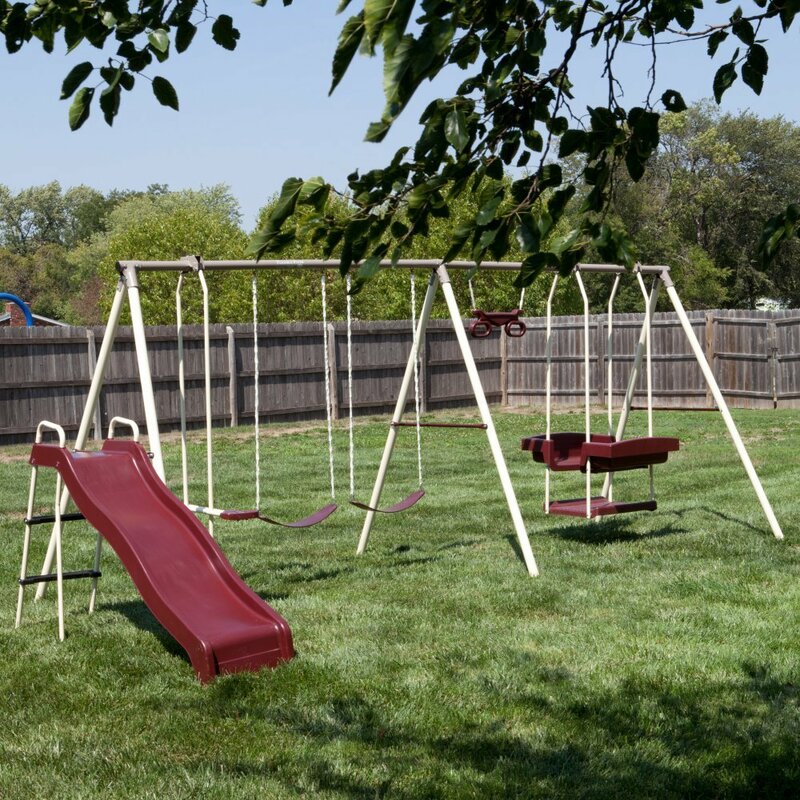 We will cover both kinds for you today through our reviews of the Best Metals Swing Sets. Let’s get one thing clear: metal may be more durable than wood, but it has a deadline as well. Metals, unprotected and non-galvanized, will always have tendencies to corrode and rust. And natural factors like moisture and heat always make it worse. Look for metals that have been galvanized or powder-coated to give it that extra protection that it needs from external factors. This not prevents and delays rusting but also serves to improve the texture of the metal. Metals swing sets, over wooden ones at least, need to be extra stable. You need to make sure that the set is anchored perfectly in position and do not show any tendencies of wobbling and moving about. Free-standing metal swing sets get rid of this trouble. They do not require any metal stakes, cement or any other anchoring measures to keep it in place. However, if you wish to ensure extra stability then you should look for sets that offer or can be assembled with metal stakes into the ground. Metals are a great conductor of heat, you know that right? Well, one problem with metal swing sets is that they cook up in the heat of the sun on hot days. Now, this necessarily isn’t a huge problem but it does cause discomfort to the kids playing in it. Look for a swing set that is heat resistant or UV treated to deter temperature related damages and overheating of the metals. Sometimes, just having swing on the swing set is not enough! Look for more activities in the set that promote fitness and entertain curiosity of the kids. Some of the best metal swing sets incorporate several different sports like climbing, crawling, hanging through various additions to the set. Some include climbing or rock walls, cargo nets, monkey bars, etc.Many thoughtful swing sets also come with corners for your kids to sit and relax. They may include picnic tables, san boxes, clubhouses and so much more. First up on our list is the Monkey Bar Adventure Set from Lifetime. A heavy-duty and multi-functional solution. The Monkey Bar Adventure Swing Set, like the name suggests, features a 10’ long monkey bar in between the slide and a climbing pole. Speaking of slides, you get a 9’ long wavy slide that is super slippery and fast. On the left of the slide, you have 3 comfortable and open swings that are made to take on some good weight. It is made of galvanized spring and rust resistant frame making it an excellent first trampoline. For added stability, this trampoline features six legs for maximum grip of the ground. It is also wide to provide enough room for children to bounce. A cool trapeze bar is also included in the set which hangs right in between the monkey bars. The Monkey Bar Adventure Swing Set pays extra attention to safety and user-comfort as well. The entire set is free-standing, UV resistant, weatherproof, and lead-free.​ ​The sharp and harsh corners have either been rounded or capped to prevent any injuries.Apart of these, you also get 5-year limited warranty. If you are looking to take it up a notch for a few extra bucks, then the Big Stuff from Lifetime is one of the best swing sets to consider. Here’s why! It is not just multi-functional; it’s basically your one-stop solution! 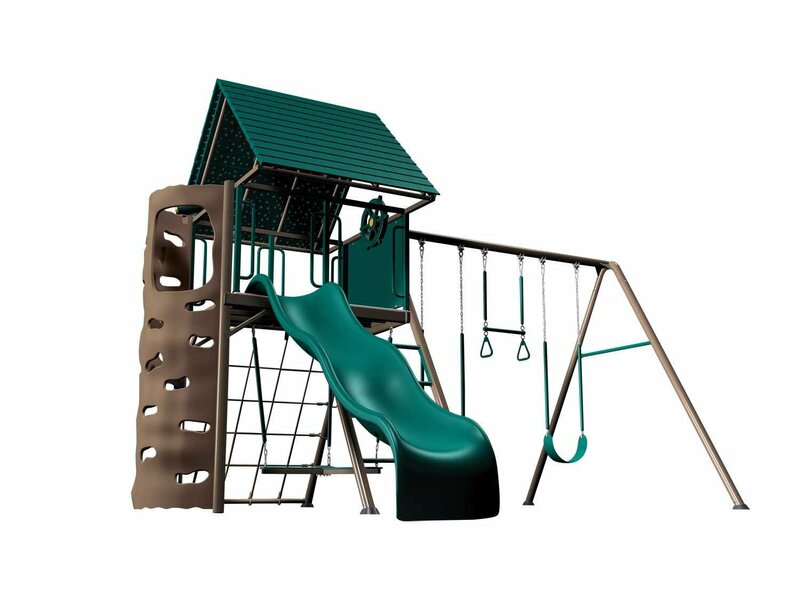 You have a 9’ wavy slide with a swing set of 4 swings: 2 general swings, 1 trapeze swings and 1 2-person propeller swing. Here’s is where it gets exciting! ​A kid-friendly binocular is also included in the deck. The Big Stuff Adventure Play Set is UV resistant, weatherproof, free-standing and childproof. And of course, Lifetime’s specialty: 5-year warranty. We want our list to cater to as many people as possible. Which is why, we brought you the A-Frame metal Swing from Lifetime for someone who’s looking for something simple, basic and affordable. 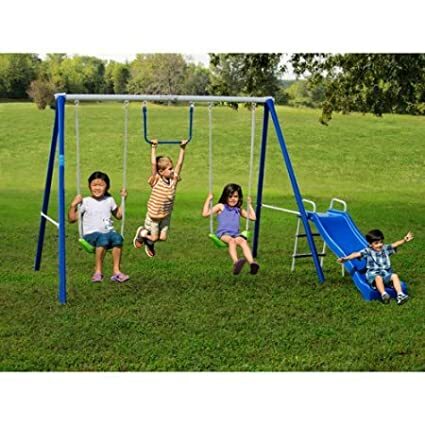 This swing set features a total of 3 swings: 2 generic swings flying and swaying back and forth and 1 trapeze bar swing for the wild ones. The entire framework is free-standing; meaning, you do not have to use any cement to anchor it in position. The low alloy steel used in its construction makes it weatherproof and less demanding of maintenance and looking after. As for safety, all the sharp and harsh edges of the framework has rounded or capped with plastic. The soft rubber grips on the swing chains ensure your kid never gets scratched or pinched from it. The nice thing about the simplicity of this swing set is that it does not demand a huge space. And yes, you of course get the Lifetime special of 5-year warranty with it too! 4th on our list is something that caters to a more small-scale of audience; it is the Flexible Flyer Fun Time by Generic and it is perfect for toddlers! There nothing much to say about the Flexible Flyer Fun Time other than the fact that is will a no-fuss, basic and simple swing set. It is small in size and will fit right into pretty much any back or front yards. It features a total of 2 swings: 2 normal and 1 trapeze bar swing. And beside it, you have a cute little blue slide. The Flexible Flyer Fun Time can allow 4 kids at a time and can accommodate children from 3 to 14 years of age. 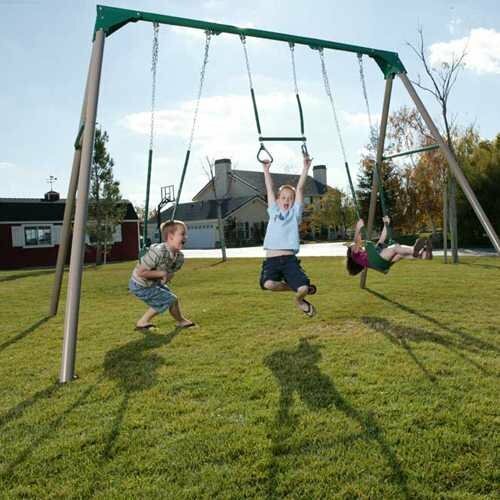 The heights of the swings are adjustable and it comes with metal anchoring stakes that keep it put in place. You can replace any of the three swings to attach a baby swing too! Let’s end our list of the with the Play Park Swing Set from Flexible Flyer.This multi-function swing sets includes all the things you want to keep your kids both entertained and active. It features 2 normal swings that allow for height adjustments to cater to older or taller children, one glider swing and 1 trapeze swing. You also have a swing that seats 2 children at the same time to sway the swing back and forth like a sailing ship. Other than these, the set also includes a fun, wavy slide which spans 6’ in length. It will allow up to 10 kids at a time. The Play Park Swing Set has a powder-coated finish to ensure both visual appeal and durability. The chains of each swing are vinyl coated to prevent pinching. Swings sets are probably the best toy you can give to your children. Get them one of the best swing sets and you can expect it to last for years to come. We have put complied some of the best swing sets for kids to make sure you are never short of quality options. 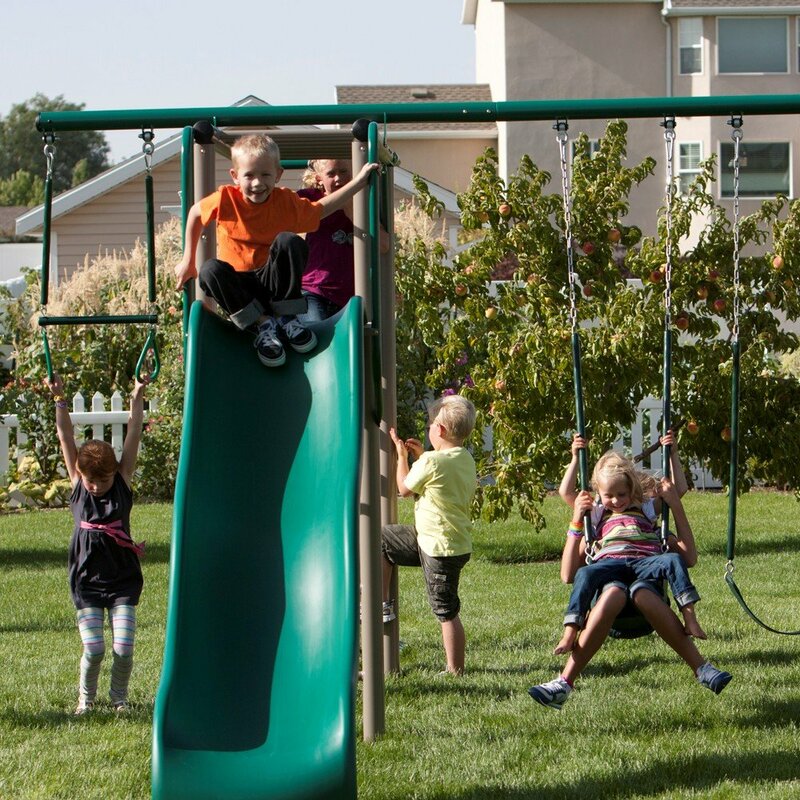 Go through the guide carefully and read through our list of the 5 best metals swing set reviews to assess your needs and demands. We are at the very end of our article now; we hope you enjoyed reading it so far. Visit the link of each product for a better look if you want. Good Luck!